You will receive a secure user name and password to access the full writing website to help manage WPP Online in your classroom. 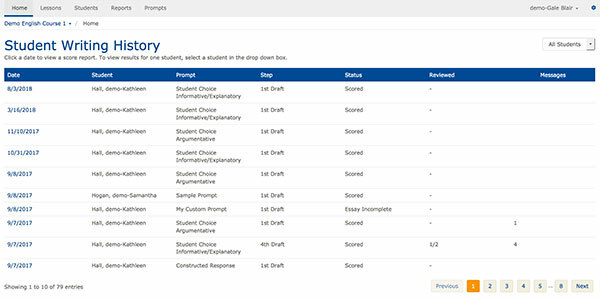 Upon logging in, you can change your password, access the Help page, adjust personal display settings, sign out to return to the Welcome page, and access the five main action tabs for Teacher use: Home, Lessons, Students, Reports, and Prompts. The Select a Course table lists each course by Course Name, Status, and Course Code, Grade Level and Expiration Date. You have unlimited access to courses with an "Active" status. However, access to courses with an "Inactive" or "Closed" status is limited to managing reports. To change courses, click on the course name drop down menu in the left corner of the page. You can also change courses by clicking on the Change Course link at the bottom of the page and selecting a different course from the list.